Student performance and test scores increase up to 10.9 % when learning conditions/good school buildings are utilized. Multi-state research proves the obvious: students learn more, score higher on standardized tests, and feel more motivated when their classrooms are clean, comfortable and well-equipped, according to David C. Thompson, ed. leadership chair at Kansas State University & other researchers. The bottom line: Good schools are an essential component in student learning because kids and teachers perform better in high quality, clean, and up to date learning environments! But the DNR mandate clouds this bottom line and educational fiscal planning and operations with shrinking, inconsistent contributions. The DNR’s share of K-12 costs have crashed from more than 60% of school construction costs in the 1980s to just 25% since 2002, according to OSPI because of volatile lumber markets, our population explosion, and harvest-impinging environmental regulations. Shrinking DNR contributions have helped accelerate the dangerous rise of toweringly high capital bond votes across the state. These frequently fail and students suffer by being packed into old schools, classrooms, and portables like sardines in a can. Replacement bond votes fail, schools go unbuilt, and children are packed into schools, classrooms, and portables like sardines, especially in low-income districts, like the Highline School District and many others, where students of color suffer the worst effects of the failed mandate. The ever-unpopular, make-shift solution to unhoused students? 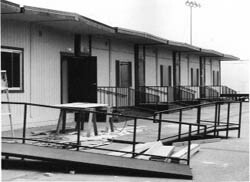 Portables. 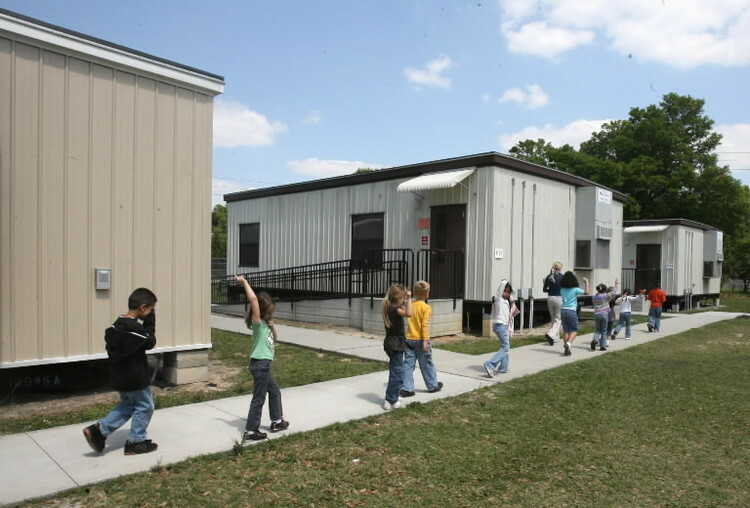 Every day, over 100,000 students are relegated to “portable” classrooms in school parking lots across the state. In 2012, the Seattle School District reported that 5,000 students — 10 percent of the student population — sat in portables, and others studied in gyms and hallways. The National Education Association ranks Washington 43rd in class size averages, in part because of unavailable school construction money. This problem will increase, dramatically, with the new K-3 classroom size reduction initiative. Keeping the DNR in the equation does not help the situation – it hinders and clouds budget forecasting in the already hazy, broken funding process for new schools. Would you want your son or daughter learning in one of these? This revenue-driven policy imperils our state’s majestic forests, wildlife, and sacred salmon rivers, yet in return it provides scant cash for school construction. In 2014 for instance, DNR timber sales contributed a typical, minuscule $120 million to Washington’s $7.6 billion K-12 budget. $120 million barely buys one new 4A high school. For the entire state! A drop in the bucket. Note: The DNR contributes an average of only $120-$200 million per year, an amount that can be manageably covered within WA’s multi-billion dollar budget. A new state tax on capital gains could raise about $700 million per year in new resources. Legislators could extend tax increases passed in 2010 that are set to expire, generating $630 million in the next budget cycle. Include compensatory revenue in the McCleary rewrite of the state K-12 budget. See the full McCleary decision here. See McCleary funding requirements/background here. Get involved now! Spread the word via social media: tell the governor & legislature to end dangerous DNR mandate. I support the end of the DNR mandate to log public lands for public schools under the Common School Construction Fund because the DNR's financial contribution to schools is negligible while the negative impact on forest wildlife and fisheries is enormous. The McCleary decision highlights the need to better fund public education without reliance on timber sales. SHOULD Washington clear-cut public forests to fund new K-12 schools? It seems unthinkable that our smart, outdoor-loving citizenry would condone clear-cutting thousands of acres of trees each year to help fund public education.